At the Tom Coughlin Jay Fund, we consider every family who is part of the pediatric cancer community part of our Jay Fund Family. One of the greatest privileges of the work we do is watching children who tackle cancer grow into young adults. Having long-term relationships allows us to understand the ongoing effects of childhood cancer and to BE THERE throughout the journey. Mighty Miles got his nickname because his family best describes him as equal parts Minion and Energizer Bunny with a Tasmanian devil on the side. Just shy of his fifth birthday, Mighty Miles was diagnosed with Leukemia – news that made him feel anything but mighty. During his initial 8-month regimen of intense chemotherapy, Miles was unable to participate in sports, playdates, parties, or attend pre-school. But Miles and his whole family were surrounded by a strong team of supporters — friends, doctors, nurses, even professional athletes, and the Jay Fund. He and his family attended Family Fun Day, cheered on the New Jersey Devils hockey team, and received gifts during the holiday season. Jodi, Miles’ mom, said, “Thank you for helping bring back Miles’ spark while creating lasting memories for our entire family.” Now that Miles is back to being a master LEGO builder and is cleared to go back to school, it’s safe to say Mighty Miles is back to his cheerful self with a smile that lights up a room! Jennifer knew something was wrong from the first moment she held her newborn baby, Olivia, in her arms. “I couldn’t get her to warm up, even with the many blankets I wrapped her in,” recalls Jennifer. At only 12-days-old, Olivia was diagnosed with Craniopharyngioma, a brain tumor. Four days later, Olivia underwent an eight-hour, life-saving surgery where doctors removed her entire pituitary gland. Today, two-year-old Olivia is vibrant and healthy. She loves to color, sing the alphabet, and make friends with everyone she meets. Olivia’s beautiful smile and infectious laughter have graced the Jay Fund’s annual holiday party and Valentine’s Day celebration. The family has been able to enjoy priceless family moments at Sesame Street and The Very Hungry Caterpillar. Additionally, the foundation has been able to help with car and mortgage payments thanks to your generosity. “The Jay Fund saved our family. Their support truly changed the trajectory of our home,” said Jennifer. Olivia will endure follow-up appointments to monitor the side effects of the treatment for many years, but she and her family know they can always count on their Jay Fund team. No one fights childhood cancer alone. Thanks for being part of Olivia’s team! During the summer of 2017, eight-year-old Austin was diagnosed with Osteosarcoma. The news was devastating and his youthful dreams of competitive swimming were replaced with life-saving surgery and chemotherapy treatments. Your generous support to the Jay Fund allowed Austin’s parents to be there with him during his treatments and provided opportunities for the family to enjoy being a family. Austin’s mom, Grace offered her gratitude in an email, saying, “Thank you for putting children like Austin first and helping them feel like kids during these rough times. Your support truly helps make the children and their families’ lives a bit brighter. For this, we will be eternally grateful.” Today, Austin is back in the water, chasing his Michael Phelps-like dreams with his family and Jay Fund team cheering him on. Thanks for being a part of Austin’s team! Gavin is a 9-year-old boy who was diagnosed on January 25, 2017 with Acute Lymphoblastic Leukemia (ALL), a form of cancer that is often found in children. Helping him fight is his father, Paul, mother, Cassandra and twin brother, Blaine. When Gavin was first diagnosed, Paul and Cassandra, like lots of families in similar situations, were shocked, devastated and were questioning what life was going to bring. The other question was what the cost and financial burden would be between doctors’ appointments, treatment, travel expenses and more. Both Paul and Cassandra were attending school at the time of Gavin’s diagnosis. Expenses for the household, college and now cancer treatment can add up quickly, and that worry came immediately after Gavin’s diagnosis. With the Jay Fund’s help, both Paul and Cassandra were able to continue their schooling. Paul finished shortly after Gavin’s diagnosis, and is now an Occupational Therapist. Cassandra is finishing school and will pursue her career as a high school math teacher. Financial and emotional help from the Jay Fund has made a huge impact on this family’s life and it’s because they were able to continue some normalcy, and Paul and Cassandra were able to focus solely on their two boys. 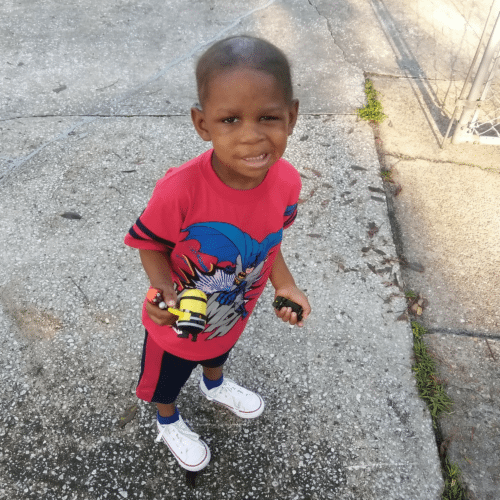 At just two years old, Donte was diagnosed with Atypical Teratoid/Rhabdoid Tumor (ATRT), a very rare, fast-growing brain tumor. Mar’Keisha, Donte’s mom, was in shock of the diagnosis, and even more so when the doctors told her Donte only had a thirteen percent chance of survival. The Jay Fund has been very involved in Donte’s family by helping them overcome the unthinkable and BE THERE by paying for several mortgage payments for Mar’Keisha, and providing gas/grocery gift cards so she could tend to her family’s needs and focus on Donte’s well-being. Donte also has two sisters. When he was diagnosed with cancer, his mom was afraid that any sense of normalcy would be gone from her children’s lives. The Jay Fund made sure that was not the case. “The Jay Fund gave us opportunities, not only for Donte, but for his sisters too, so they could enjoy being kids during this time of our lives. I cannot thank the Jay Fund enough,” said Mar’Keisha. From circus tickets to support to make their holiday season feel normal, the Jay Fund choses to BE THERE every step of the way. Jasie as she is known to her friends is an 8 year old little girl from New Jersey who has a smile that lights up the room. We first met Jasie at our annual Valentine’s Day Party with Zak DeOssie at Newark Beth Israel Medical Center. Jasie is a huge Giants fan and loved meeting Zak and posing for pictures with his Super Bowl ring. Later in May, Jasie and her mom attended the Giants Tour and Sundae Blitz at Met Life stadium where she met former Giants Super Bowl Champs Chris Snee and Shaun O’Hara. Jasie never stopped smiling as she toured Met Life Stadium and tried on Giants player’s size 18 sneakers. Because of chemotherapy side effects and high susceptibility to infection, Jasie is not able to attend school. She requires full time care and must be supervised by her caretaker at all times to monitor for treatment side effects and administer medications as needed. The family faced possible eviction if not for the Jay Fund’s support. Kasey and her family joined the Jay Fund in March when she was diagnosed at age three with Acute Lymphoblastic Leukemia. She has three siblings: Hannah (11), MacKennah (9), and Finn (18 months). Since Kasey’s diagnosis, life has changed for the her family, especially for Hannah and MacKennah. Both girls have provided lots of help and love to Kasey and Finn since childhood cancer became a part of their lives. They have also been a big help for their mother and father as they all help Kasey tackle childhood cancer. Kasey’s family is grateful to be part of the Jay Fund family. They are especially excited to have Hannah and MacKennah join J.A.Y.S. Team, the new sibling support program, so they can meet other siblings and share their own story on how they help their sister tackle childhood cancer.